Great for Conference Rooms, kids playrooms, and schools. All have Black T-Mold, and Black and Chrome legs. 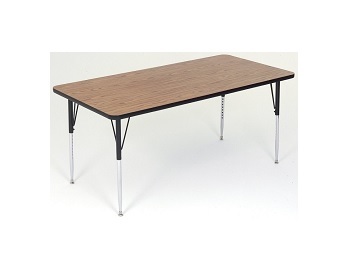 This laminate top table is a build-to-order product. This means when your order is placed, Correll will put your order into product. The A2448 will typically leave the factory in Arkansas within 3-5 business days. From there, transit times in the continental United States vary from 3-6 business days. Q: Is this table stain resistant? A: Yes and no. The majority of things that can stain a normal table cannot stain this table. Shipping on In Stock Items: Orders for the Correll A2448 generally leave the warehouse within 1-2 business days. Dimensions: 48" x 24" x 3"